The Knysna forests form part of the Tsitsikamma forest belt and have been so badly mauled by wood merchants over the years that only 0.2% of all South Africa's natural forests still exist. It is in this area that the elusive Knysna elephants roam free. Way back in 1772 when the timber rush started there were thousands of elephants in the southern Cape region. Travellers on their way to Port Elizabeth and Natal often had to wait for hours while herds of elephants crossed their paths. The local timber merchants saw the elephants as a means to having some fun and earning a few extra bucks so arranged hunts and slaughtered many elephants in the process. Of course the woodcutters soon climbed on the bandwagon and hunted elephants for their tusks which were then smuggled into loads of timber and sold for the princely sum of a half a crown a tusk. According to reports 500 elephants were being slaughtered annually. No resource can withstand losses of this magnitude and soon very few elephants were left in the southern Cape. By 1870 the remaining elephants thought to number between 400-600 existed in the narrow 200 kilometre stretch of land between the Outeniqua/Tsitsikamma Mountains and the coast. Stocks continued dwindling and by 1920 there were only seven elephants left. Over the years studies have been undertaken and in 1944 it was found that there was a slight increase in the numbers. A survey in 1970 revealed 11 elephants. In 1980 only two elephants could be found in the forests and they were a cow and a calf. Strange things were happening, only two elephants and yet in 1989 a calf was born. Who was the father? No one knew. To preserve the elephant population in the forests and to increase their numbers three young elephants were introduced to the forests in 1994. This experiment failed and one elephant died. The other two were removed to the Shamwari Game Reserve in the Eastern Cape where they have been integrated into a large herd of elephants. In the past few years a number of surveys have been done and two younger elephants have been discovered in the forests around Knysna. This is good news as it was thought that the 45 year old cow who has been called the ” Matriarch “ was the last of the Southern Cape elephants. Who knows how many more elephants remain hidden in the 70000 hectares of thick forest in the Knysna area. Researchers are combing the forests and every now and again come across tracks and dung left behind by elephants. Hopefully these elusive animals will stay hidden and far away from the greed of men who only have profit on their minds. For those people who will never see a wild Knysna elephant there is however a way out. 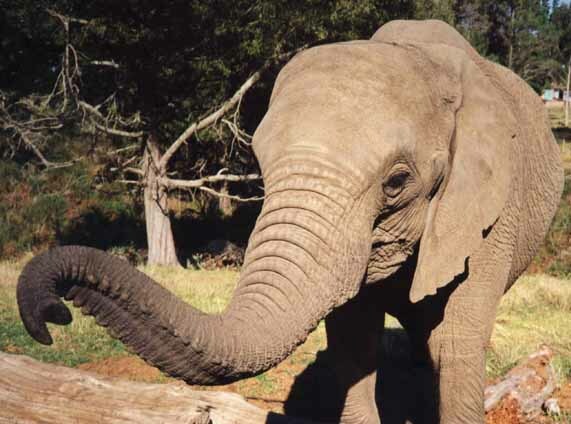 A farmer in the Plettenberg Bay area has adopted three young elephants who are people friendly. On his farm you can get close up and friendly with them. It's especially exciting for children as they can feed the elephants and put their hands into the elephants mouths and feel their large tongues and pat their course looking hides. The elephants love the attention. When you next visit Knysna and take a hike through its forests keep a sharp look out for the wild elephants. You never know when you might walk headlong into one.